What’s the anatomy of a 33-28 loss? A loss to hated Colorado (2-0) that came unexpectedly in coach Scott Frost’s Nebraska (0-1) debut and a loss everyone could have probably seen coming. Nebraska put its new-and-improved offense on full display on Saturday. When the Huskers scored with 2:24 to go before halftime, taking a 21-14 lead and capping a 79-yard drive, it ensured the team would rack up more yardage in the first half of Frost’s first game than it did in any first half in 2017. The Huskers piled up 329 yards on 46 plays. The high in 2017 was 313 yards on 42 plays against Wisconsin. In the end, Nebraska hit the 500-yard mark, a spot it didn’t reach at all last season. “We showcased ourselves pretty well,” guard Jerald Foster said. And this is Game 1 we’re talking about. A losing team doesn’t often boast those kinds of numbers. But, Nebraska turned the ball over in crucial spots on Saturday. When the Huskers fumbled away their first two possessions and Colorado scored touchdowns off of both, 90,000 previously delirious fans became hushed. The team finished with three turnovers to Colorado’s none after true freshman quarterback Adrian Martinez threw a possession-and-10 pass right to a Colorado defender. A winning team doesn’t often lose the turnover battle by that wide a margin. But, Nebraska ran all over Colorado on Saturday. When the final whistle blew Nebraska had 329 rushing yards compared to Colorado’s 44. The yardage marked the most a Nebraska team has gained on the ground since Sept. 27, 2014. It’s the first 300-yard performance since Sept. 24, 2016. Both Martinez and junior back Greg Bell topped 100 yards; it’s the first time Nebraska has done that since the same 2014 game against Illinois. The seven (seven!) sacks Nebraska logged helped drag down the rushing numbers a little bit, but Nebraska won the game up front. A losing team doesn’t often do that. But, Nebraska couldn’t stop shooting itself in the foot on Saturday. When senior safety Antonio Reed leveled a hit on a Colorado receiver coming over the middle and a yellow penalty flag came flying into the picture, everyone dropped their head. Colorado was at third-and-24, looking at fourth-and-24. Reed’s hit was deemed unnecessary and Colorado was awarded 15 yards and a first down. The Buffs scored the game-winning touchdown on the next play. It served as the defining play on a day that saw the Huskers get flagged 11 times for 95 yards. 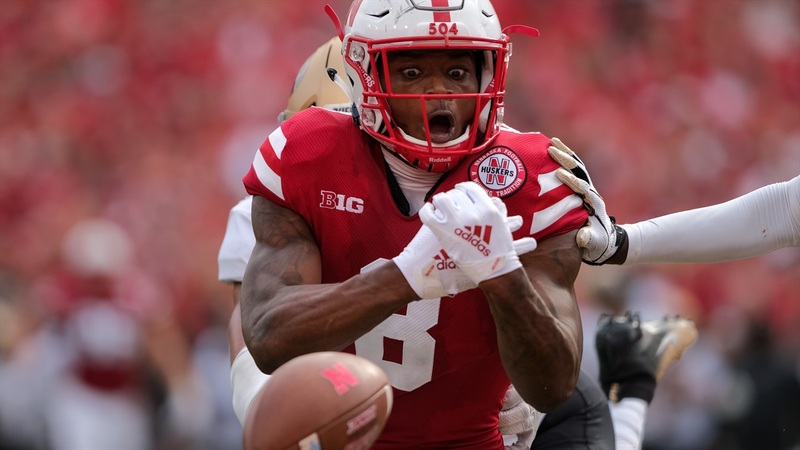 There was a false start on the team’s final drive that cost Nebraska its final timeout, a few holds on special teams in the first quarter and a hold on a fourth-quarter drive Nebraska was hoping would bleed the clock out. A winning team doesn’t often make that many knucklehead plays. “When you’re trying to go from an average team to a great team, you don’t beat yourself,” Frost said after. “We can’t beat ourselves. We’ve got to learn those lessons. We’ve tried preaching them to them a lot. If this team didn’t beat itself today, we would have won that game. Such was Nebraska’s season-opening loss to Colorado. On one hand, Nebraska flashed a team that could have and probably should have won a football game Saturday. On the other, Nebraska was Nebraska’s worst enemy. Scroll back up to the top of this page and look at the cover photo. That's senior wideout Stanley Morgan Jr. dropping a touchdown. That's Nebraska's star player and top offensive weapon just missing a ball thrown perfectly into his hands from Martinez. It would have given Nebraska a 35-27 lead. It could have changed the game. Morgan had drops last year, sure, but he also broke a program single-season yardage record. Those things can't happen. Frost said as much after the game. So did just about everyone else. Safety Deontai Williams was asked what the message was from the coaching staff in the locker room following the game; he said they were told they were the better team. “It’s just like a drill, you’ve got to finish. We didn’t finish,” he said. And in the second and third quarters, quarters where Nebraska looked to be in the driver’s seat, the team was bouncing around and feeling that love Frost has preached all offseason. Nebraska’s defense brought it, there’s not really any way of denying that. The team had 14 sacks all of last season and they had seven in this opening game. Asked if they’ve ever gotten after the quarterback like that, Gifford, a senior, said “never.” But none of that stuff really matters in a loss. Learning to win is something Nebraska’s going to have to do this season. Saturday offered plenty of lessons on how to do it, and plenty more on how to lose it.